But, I much prefer one-piece standalones items whenever possible. I am an advocate that build-ins should only be at areas where the shape is odd or when you need the shelving to totally blend into the background. I refuse to look into IKEA’s offering as I didn’t want a mass production feel in our bedroom (Don’t get me wrong, I love IKEA, but, I just thought our bedroom should be special). 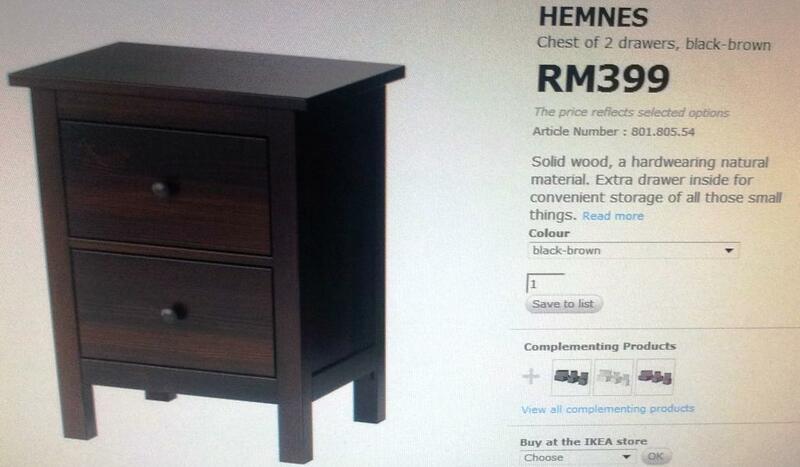 Hence, the search continues… I told hub that we should take our time and find ‘the bedside’. He just rolls his eyes whenever I hunt for my bedside table. For him, it’s not an important piece of furniture. Bleh.. But, for me, it’s important. I have been living with most of my bedside items (glasses, cups, books, Ipad, hp and etc on the floor). Is it REALLY frustrating I tell you! Every morning when the alarm goes off, I had to quickly sweep my hand along the floor to locate the handphone to switch it off / put it on snooze. Sigh… after a month, I develop special method to locate the phone. First, I locate the charger and then, I reel my handphone in (like fishing). bleh. Surprisingly, I found 2 which I kinda like. It’s not ‘the bedside table’ but, it’s good enough. Which should I get? 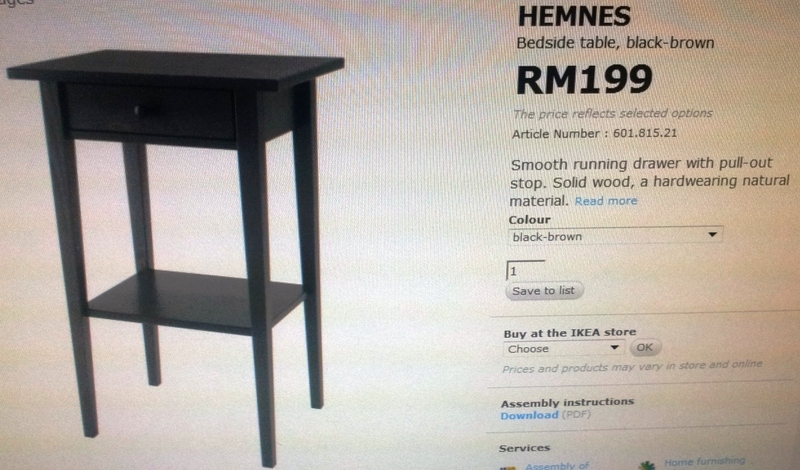 Hmm…and they claim it to be solid wood (I usually take it with big spoon of salt when it comes to IKEA’s claim to solid). I finally choose the RM199 one. Reason? I love the clean look and the availability of open space below. Can put Ipad there and also books!